One question facing the U.S. auto industry right now is the potential entry of Chinese car manufacturers into the American market. Over 50 percent of respondents to our [recent Booz & Company] survey said they expect China to own more than 5 percent of the American automobile market by 2020, just two product cycles from now. Under this thinking, China would replicate the strategy of Japanese carmakers 30 years ago and Korean manufacturers a decade ago: establish a foothold with low prices, and then improve quality and brand perceptions. The only difference, according to this view, is that Chinese companies could accomplish this faster and more easily, based on the scope of their domestic market. Is this level of market penetration likely? Maybe, but not by 2020. The actual performance and capabilities of the leading Chinese vehicle manufacturers—as well as their readiness to compete in developed markets such as the U.S.—is overestimated, for several reasons. First, the size and scale of these companies is fairly small, especially separating the sales volumes of their Western joint-venture partners. In most cases, the joint venture itself far overshadows the relatively young Chinese brand. In addition, the domestic market in China is geared to first-time buyers in hyper-competitive entry-level segments, where margins are difficult to sustain, so their overall profitability is typically quite low. That reduces the resources these companies have to expand overseas. All of this is certainly not lost on the leading Chinese manufacturers, such as Chery, Geely, Great Wall, and SAIC. These companies have all set aggressive international expansion targets of more than 500,00 units by 2015, but almost entirely in developing countries, instead of in the more mature North American and European markets. It will probably take several more years before they can consistently meet competitive product reliability and durability standards, along with U.S. homologation requirements and product specifications. In fact, many Chinese manufacturers fear the potential product liability and other lawsuits in the hyper-litigious U.S. business environment. For these reasons, even among developed markets, Europe may be a bigger priority than the U.S.
To crack global markets, Chinese automakers must develop world class global supply chains and supplier partnerships, offer competitive financing products, and deploy the talents of a global human resources pool. That won’t happen overnight. It will also take some time for Chinese carmakers to learn to compete in markets where they don’t have the benefit of a low-paid labor force, management team, and supplier base, as well as favorable subsidy policies from the central and local Chinese government. It will also be essential for these companies to build a retail network and brand in the U.S., which is a substantial investment. Nevertheless, many Chinese automotive executives aspire to capture a meaningful share of the US market. Some have started to evaluate potential entry strategies. For example, Great Wall, China’s leading producer of SUVs, is in discussions with several companies to establish a dealer network in U.S., while BYD is testing its alternative energy models, including the all-electric e6 Premier. SAIC, China’s largest automaker, has bought a majority share in Visteon’s global interiors business with the objective of developing its supplier capability in the US. Eventually, the U.S. market will see more new competitors emerging from China, who will likely offer well-equipped models at very low prices, putting significant pressure on incumbent players. For suppliers, that outcome may present opportunities. Chinese manufacturers will have to rely on existing U.S. suppliers, due to their capability advantage over the less competitive Chinese suppliers. To capture those business opportunities, Tier 1 suppliers should begin to build up close partnerships with leading vehicle brands in China, through joint ventures or by developing simultaneous engineering initiatives. The Jeep store in south Beijing near the Timberland and London Fog outlets carries the season’s latest offerings of branded shirts, shoes, belts and backpacks. Not for sale here: Jeep sport-utility vehicles. 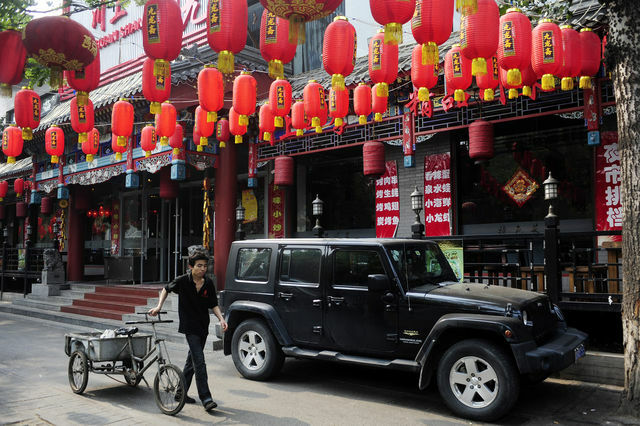 Jeep gear is so popular in China that there are more than 1,500 licensed clothing outlets in the country, where only 120 auto dealers sell the brand. While Jeep has a strong image connected to an adventurous lifestyle, three decades of changing ownership have left it without local production and missing out on surging demand for SUVs in the world’s largest vehicle market. Jeep sales rose 63 percent last year to 19,013 — less than three days worth of China sales for General Motors Co. (GM), the top foreign automaker in the market. Detroit-based GM has 2,900 dealers — more than 24 times the Jeep number — that sold 2.55 million vehicles last year, mostly Buick, Chevrolet and Wuling models. Manley, who oversees Asian business for Jeep owner Chrysler Group LLC, said he wants to increase the brand’s sales in China by expanding Chrysler’s dealer network by as much as 29 percent this year and restarting local production by early 2014. While Ford Motor Co. (F), a late entry to China, is working just to build awareness of its brand and products, Jeep struggles to meet runaway demand. The Jeep brand’s first steps into China as a consumer brand seemed promising in the early 1980s, when military versions of the off-road vehicle were widely recognized. Mann wrote a 1989 book called “Beijing Jeep” that detailed the challenges then-owner American Motors Corp. faced in setting up the first U.S. auto-manufacturing partnership in China in the early 1980s. Those challenges were immense, from cultural misunderstandings with then-partner Beijing Automotive Works to the changing ownership of American Motors when purchased by Chrysler Corp. in 1987. Chrysler itself merged with Daimler-Benz AG in 1998 before the U.S. unit, based in Auburn Hills, Michigan, was sold to Cerberus Capital Management LP in 2006. By the time Turin, Italy-based Fiat SpA (F) took control of Chrysler and its Jeep brand in 2009 as part of the U.S. automaker’s government-backed bankruptcy reorganization, Jeep’s original manufacturing partner had become Mercedes’s partner. Jeep output in China stopped in 2006. Without an assembly partner, Chrysler has been looking for one in China as required to avoid steep tariffs. Manley also runs Asian operations for Fiat, Chrysler Group’s majority owner. Fiat’s partner, Guangzhou Automobile Group, would be a natural and officials with that company have said they want to build Jeeps. “Of the options that are out there, which is the easiest to get to? Probably with Fiat’s joint-venture partner, mainly because there’s already a good relationship,” Manley said. Still, he said, there are a number of options for Chrysler in China. “I certainly have got the teams involved in it focused on coming up with the right solution for us by the end of the first half and I like to think we can do that,” Manley said. It will probably take at least 18 months to begin production after deciding on a partner and receiving government approvals, he said. In the meantime, he watches as imported Jeeps continue to see sales growth even though the duties push up prices. The Jeep Grand Cherokee starts at 575,900 yuan, or $91,064. In the U.S., it starts at $26,995, according to company websites. The 2012 Grand Cherokee SRT8 version costs at least 1.2 million yuan, or $189,750, compared with $54,470 in the U.S., according to Edmunds.com. Deliveries of SUVs will probably increase 16 percent this year to 1.85 million units, the fastest-growing segment of China’s automobile industry, according to the latest forecasts from the state-backed China Association of Automobile Manufacturers. The category grew 20 percent last year, according to CAAM. Chrysler’s limited product range also makes it harder for the company to expand its dealer network, said Russo, who is based in Beijing. In the stand-alone Jeep clothing store, the walls are decorated with black-and-white photos of military jeeps as well as modern-day Wranglers. The brand’s ruggedness image led Ding Qi, a Shanghai businessman, to buy his wife a Jeep Grand Cherokee in 2004. “I wanted to buy her a safe, rugged car, not one of those dainty subcompacts,” he said in an interview. They use the SUV to go on drives with a local Jeep club. This year, the club, which has 200 members, plans to take a 48- day cross-country trek from Shanghai to Tibet to Nepal and back. Yang Yang, 35, replaced her 2004 Grand Cherokee with a Volkswagen Tiguan this year because, she said, she thought the newer Jeeps had become less rugged. The vehicle’s capabilities are so spectacular that sometimes they draw a crowd, she recalled. To contact the reporters on this story: Tim Higgins in Southfield, Michigan, at thiggins21@bloomberg.net.